Adam Devine, Rebel Wilson and Priyanka Chopra in ISN’T IT ROMANTIC. Courtesy of Warner Brothers Pictures. Director Todd Strauss-Schulson isn’t exactly a stranger to putting new spins on old formulas. His previous film, THE FINAL GIRLS, is a self-aware, self-reflexive twist on the horror genre that’s both hilarious and surprisingly heartfelt. That’s perhaps what made him the perfect candidate to cleverly craft another intelligent meta-commentary on another genre with the ingenious romcom ISN’T IT ROMANTIC. In the fantastic feature, Natalie (Rebel Wilson) suffers a concussion and awakens in a fantasy realm – essentially trapped in a glossy, glamorous romantic comedy. Not only must she navigate her way through the tropes of that world, but she’s gotta figure out what brings her life genuine satisfaction. At the film’s recent Los Angeles press day, I spoke to the talented director about everything from this film’s far-ranging influences, to Liam Hemsworth’s hidden comedy chops, to the film’s epic, uplifting dance number. I heard you watched an enormous amount of romantic comedy films to prepare for this. I did watch 80 romantic comedies in 10 days. I wanted to decode the genome – crack the code and see all the patterns. Romcoms have shaped our society and contributed to its toxicity, where what’s previously been viewed as a romantic gesture is not anymore. Were there certain trappings you wanted to avoid to put a modern spin on this in your approach? It is the impulse of the whole movie, which is to ask the question, “Is the love stories we tell ourselves helpful or hurtful?” They can be more isolating or set up a completely false expectation, or premise of life for people. I think that it is. They’re a bit adolescent about romantic love. It’s all about desire- about falling in love. Even the whole term “falling in love” seems unhelpful – that you’re powerless, tumbling downwards, as opposed to rising. Grow with someone else! Challenge each other! Lift each other! Not all of them, but a lot of them is this idea that you are not complete until someone finds you and saves you. That all of your loneliness will be vanquished if you swipe right enough times. It suggests that you’re not whole until that happens. That’s so not true. I know that was one of the big reasons Rebel wanted to make this movie – and me too. That’s really what the movie is trying to show you. Not until she can accept herself thoroughly can she change and open – and only then is she whole enough to invite love in if she chooses to. It’s a choice. I know that romcoms are mostly associated with women. But they also send a fucked up message for guys too. It teaches you that what women want, where the only love you’ll be able to get as a guy is if you’re super handsome, have a ton of hair, are rich, are a bit of a swash-buckling womanizer, and that’s what women want. Have you seen THE UGLY TRUTH?! That’s the most toxic one. It’s insane. The things that women find in those movies – not all of them, not SLEEPLESS IN SEATTLE – but the things women fall for are not good things for men to strive to be. Was it a challenge to find your own unique, swoon-worthy moments that both embrace and satirize the genre whilst sustaining that tone throughout? THE FINAL GIRLS is a bit the same trick because you’re using the genre deconstruction to subvert and deepen a story. You’re trying to do something that’s irreverent, but authentic. 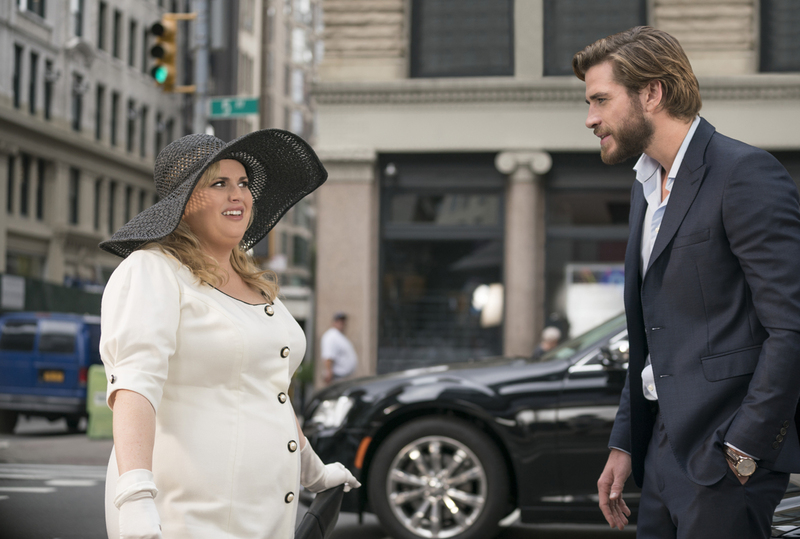 Rebel Wilson and Liam Hemsworth in ISN’T IT ROMANTIC. Courtesy of Warner Brothers Pictures. I’m curious about collaborating with your cinematographer Simon Duggan, production designer Sharon Seymour and costume Leah Katznelson to create Natalie’s two distinct worlds – her reality and fantasy. There was this idea of making real life New York really not feeling like it’s a movie. It’s more fly-on-the-wall, sloppy, having almost no score. I’m from New York and really wanted to do New York well. I wanted to shoot it exactly how it looks. Don’t move the garbage. Don’t move the bikes chained to the parking meters. Can we cast all the background extras from the neighborhood? Don’t bring people in. There’s a lot of references there, watching HANNAH AND HER SISTERS, or MOONSTRUCK. You know what’s a weirdly good New York movie? DIE HARD WITH A VENGEANCE. It looks like they shot New York and didn’t do anything to the city – which is not true, but that’s how it feels. Also, we looked at Noah Baumbach. We wanted the camera to be a mess. So when she gets into this romcom movie dream world, it would feel super slick and cinematic. All the people in the background are dressed in Brooks Brothers – it’s ridiculous, which is how those movies are. If you watch DEVIL WEARS PRADA, everyone on the streets is dressed to the nines. I hired Simon Duggan, who’s a genius who shot THE GREAT GATSBY, because I thought it would be wonderful to GREAT GATSBY-ize practical locations. I wanted to be on location, but I thought it would be very exciting to transform real locations to look like it takes place in a FISHER KING kind of way. It was a dream come true to do that in my hometown. We see things from Liam we haven’t seen before. I adored all his goofy, hammy asides like whenever he’s on the phone, where he’d do a dance, or kick plant. Were those ad-libs? They weren’t in the script. One of the things about Liam is that he’s funny in real life. I wanted to give him a lot of runway to be goofy in that way. I knew that a lot of the time in these romantic comedies, a trick to make the hunky guy feel relatable and affable is that they are sometimes goofballs. Hugh Grant famously does it, but there’s a really great moment from THE WEDDING PLANNER where Matthew McConaughey tells the story about how he’s a doctor and he only eats the brown M&Ms because that’s the same color of chocolate and he thinks those are heathier. It’s such a dumb monologue, but it’s the most charming part of the character in that whole movie. It was really this idea to see a guy cut loose and be child-like was a great to connect with that person. I would suggest to Liam to do that kind of thing. That’s where that came from, but the fact he was so good at it is all about how talented he is as a performer, but also how much he was enjoying getting to be goofy. Priyanka Chopra and Rebel Wilson in ISN’T IT ROMANTIC. Courtesy of Warner Brothers Pictures. I’m wondering if we can break down the Karaoke bar sequence where Rebel sings “I Wanna Dance With Somebody.” What it was like to shoot, how many days, was everyone on board with it? I love a musical number. It seems to happen in everything I’ve made. I think it’s pure cinema if you can do it good. I get so frustrated with certain kinds of movies that set up eight cameras and choreograph a dance number and that’s it. It’s so lazy. That’s not how musical numbers were in the ‘30’s. They’re visual and it’s embodied storytelling and I love it. I tried to build sequences where I visualize what the music sounds like. What would this music look like if the camera was the tip of a baton. With the karaoke, it was like, “Let’s make this a show-stopper.” Having Rebel, Adam and Priyanka in a musical number and having it be set to Whitney Houston, you know that’s a good one. You have a lot of very special ingredients there. You want to create a sequence that is as good as the elements in it, but we didn’t have a lot of time to do it – a day and a half – so it was very challenging for the ambition. I sat a lot with my eyes closed and designed a sequence to tell the story. The concept is she’s not confident and this is a magical dream world and it’s going to gather together to become the wind in her sails that pushes her into finding her confidence. And also that it would function as a love triangle between Priyanka and Adam. You’d get to see some of Rebel’s confidence come out because she was fighting for her guy. It was fun to listen to the music and see, “oh that’s a dart. That’s an egg cracking.” “My lonely heart falls?” That’s her falling off a table. The shots is that baseline. “Oh that’s what that could look like.” Then I got together with Christopher Gattelli. I had him on a list of who I wanted to work with because I’d seen HAIL, CEASAR! and I loved that Channing Tatum dance number. So much of the jokes are from clever visual ideas. We designed it together. We had a great group of dancers around. He showed me what the moves would be and I told him what the shots would be. I shot the whole sequence on my iPhone and cut it together on my laptop and made a video edit of the sequence, which is exactly like the final sequence of the movie. We had the storyboard and printed out screengrabs of every shot and had it on set. Every time we got one, we crossed it off the list – and there were 95 of those things. It felt like “Supermarket Sweep” on set, where everyone was racing to get through it fast enough and not a single one could be cut because of the music. I mean, you picked a good one. It’s nice and really gets people going. It’s a banger. I wasn’t sure if that was going to be the song. Obviously it’s a great song, but it’s not a deep cut. We had these great music supervisors. Zach [Cowie], who DJ’s for Rodarte runway parties, he always plays that song. He said, “This is the song. This is a party song. Let me show you how I do it when I get out there.” He played this record of Whitney Houston’s raw vocal, acoustic, where she does the first verse and it gives you chills. Then he drops the second one on, where it’s the backing vocals and then the instruments and it’s powerful. We ripped that idea off for this sequence. That’s why Rebel gets unplugged and is raw and then the three bridge-and-tunnel women support her. It all folds into the story. ISN’T IT ROMANTIC opens on February 13.